I am playing with my Tic Tac Who? 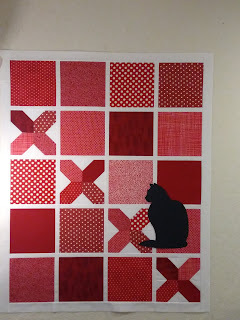 pattern this week, but the family I am making the quilt for are cat people. 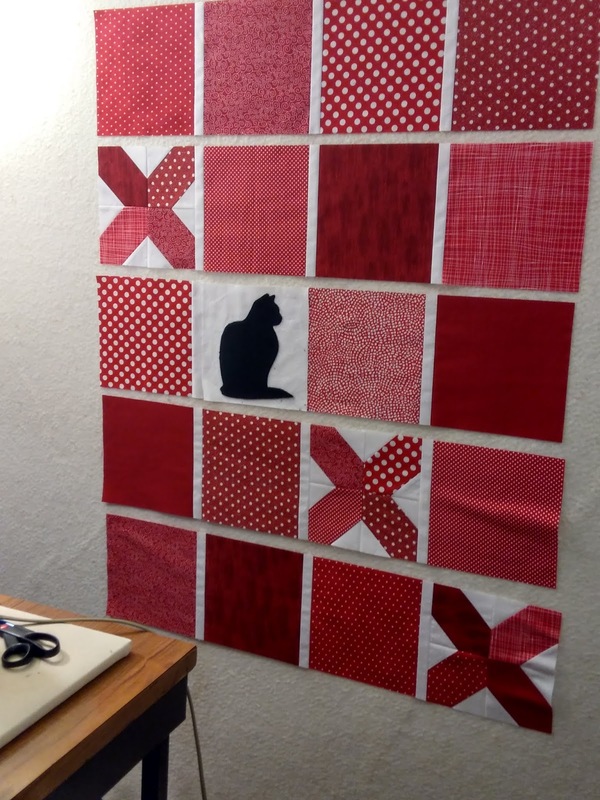 Rosie isn't sure she approves of this cat business, but I am adding an applique cat instead of my pieced dog block anyway. 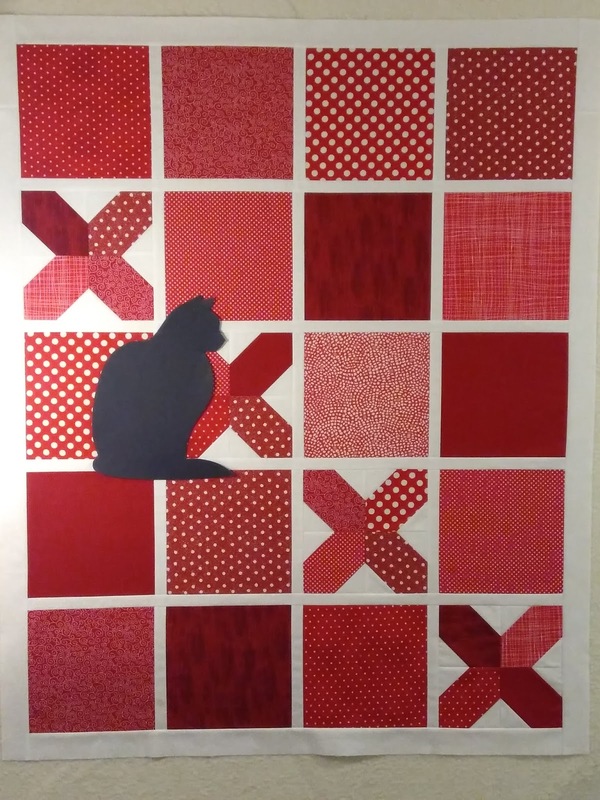 I chose a black cat silhouette pattern from the EQ8 block library and will cut it from black Cuddle fabric once I settle on a size. 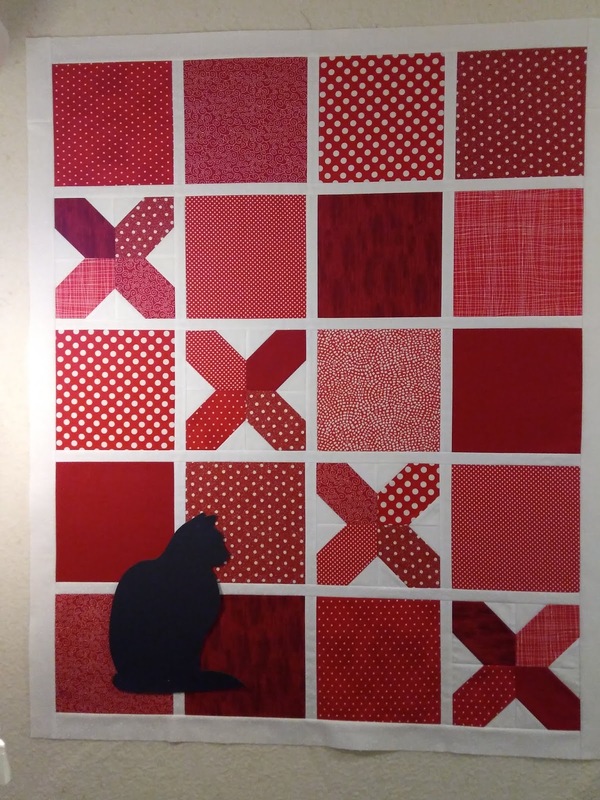 My original idea was to simply applique the cat on a blank square where the pieced dog/owl/duck block is in the original pattern. Umm. Nope. This applique just doesn't fill the space the way the pieced blocks did. The cat shape is perfect though, so I'm determined to use it somehow. I had been so sure this would work that I cut this cat from Cuddle, so I have an applique cat block to play with in some other project now. However, I am not cutting any more cuddle without auditioning with something less messy first. There's cuddle fuzz everywhere! My husband suggested a sheet of cheap poster board. Why didn't I think of that? I cut a larger cat silhouette from poster board and have been auditioning placement. 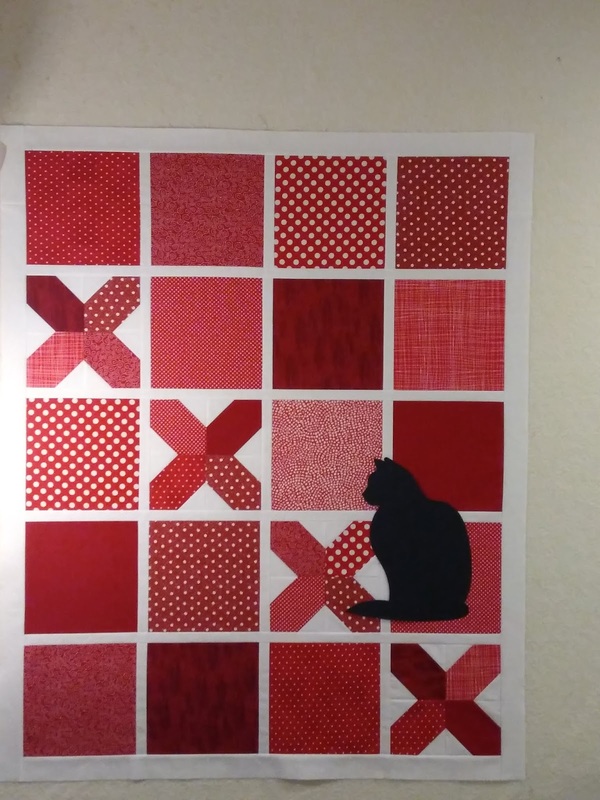 I don't have a photo of the first try, but it did lead me to fill in the blank block with another X instead of trying to plunk a cat in it. I think the size is better, but I don't like having the cat pretty much in the center of the quilt. 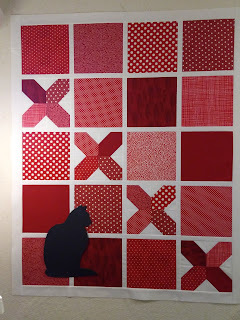 This is a bit better, but I think the cat gets a bit lost against the darker reds. There's something else bothering me about this one, but I can't quite put my finger on what exactly. I think I like this one best. I am going to let that simmer for a little bit while I baste and quilt the quilt. 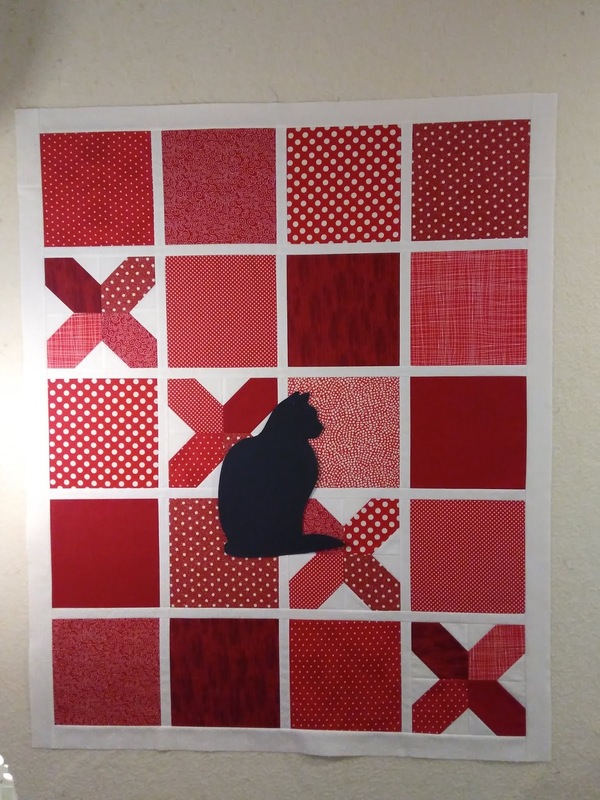 I plan to have the cat be just a silouhette, so I don't want to quilt inside or all over it, but it is too big to leave the area under it unquilted. I am going to quilt the background, then applique the cat on top. I think that should be OK. If you have any words of wisdom against that plan, please speak now before I quilt! I like what you have come up with :-) It's such a good pattern - it's nice to see you playing with it! 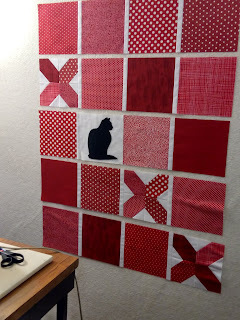 Okay, first of all, from a cat person, those x blocks should be wrinkled and scattered around the room. Because that is how a cat would arrange them. But on a serious note, I like either the cat in the bottom left or middle right placement best...bottom left being my favorite. But I do see how there's something off there...perhaps the cat's chest is too round, so the shape itself is off? It's a great idea, though, as a whole and I look forward to seeing how it all comes together. As for Rosie's approval...well, I'm a cat person, so she's not winning any points with me! Very nice, that is a wonderful pattern and can use lots of different critters in the one block. I like the last version best, too. Neat trick to make the quilt then add the applique. As for placement - pick what suits your eye. I'd choose the last one with the cat on the right. It is a very striking quilt! I like the cat in the darker colors lower left, sort of hiding while waiting for a mouse to appear up a little higher. Whichever you choose, it will be a fun quilt! 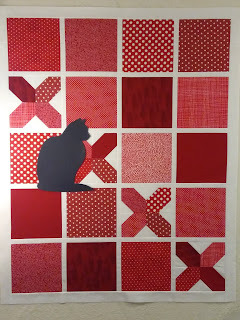 ---"Love"
Love this with the cat and the silhouette rather than in the block like the original pattern. As a cat lover may have to try one with a cat. I would favour the last version but for me I think I would move the cat a bit lower. Making the cat in cuddly fabric is a great idea. Please be sure to post it when finished. I like the last layout placement best, but also like the idea of moving one block partly out of the row and the cat sitting in the partial space. Does that make any sense at all? I would quilt the quilt first like you are going to do. I don't own a cat (does anyone truly OWN a cat?) but the neighbor's cat has adopted me. I actually prefer the cat on the white background, it seems like it's saying, "I'm the winner." The other positions make it look as though the cat were an observer, rather than right in the middle of things as most cats are. Just my 2 cents worth.